Live chat, also known as live support or live help, is a web service that facilitates communication between two entities, over the Internet through online chat in real time. This method of communication is commonly used by businesses to provide immediate customer support and information to their clients and customers on their web site, through the real time transmission of text and multimedia messages. Messages are transmitted in real time and are generally short in length, which enables participants to respond quickly. The rapid speed and flow of communication of chatting in real time, is similar to that of spoken conversation. This is distinguished from other forms of online communication, such as Internet forums, help desk ticketing and email, which provide significant delays in response. A Helloify client window from a web site. 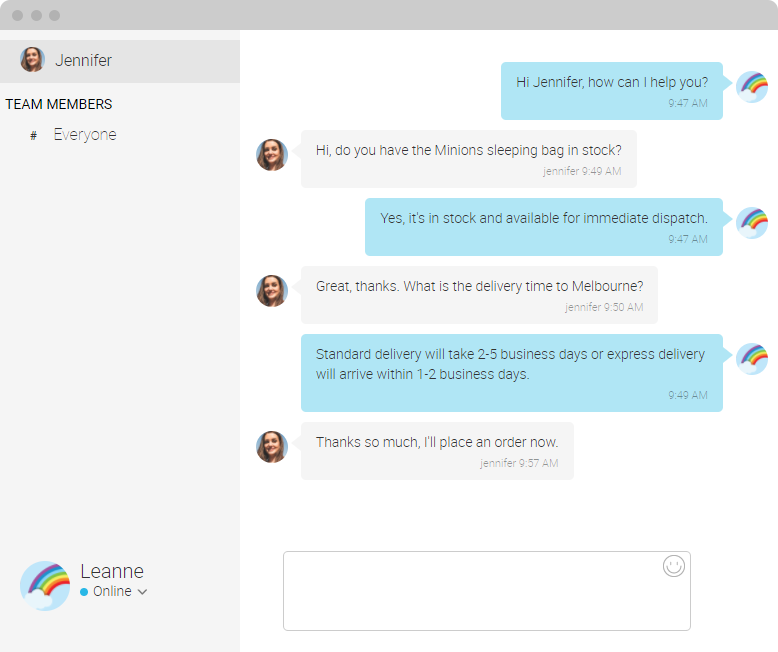 Live support is essentially a professional instant messenger for web sites and has quickly become an integral ingredient to the customer service offerings of online businesses. Online chat agents can communicate with web site visitors through online messages and assist clients with their requests, solving simple questions about products to complex technical issues, in an efficient and timely manner. A chat session offers the personal attention from a live person, with the speed of a phone call, and the additional flexibility for users to multitask and undertake other activities. 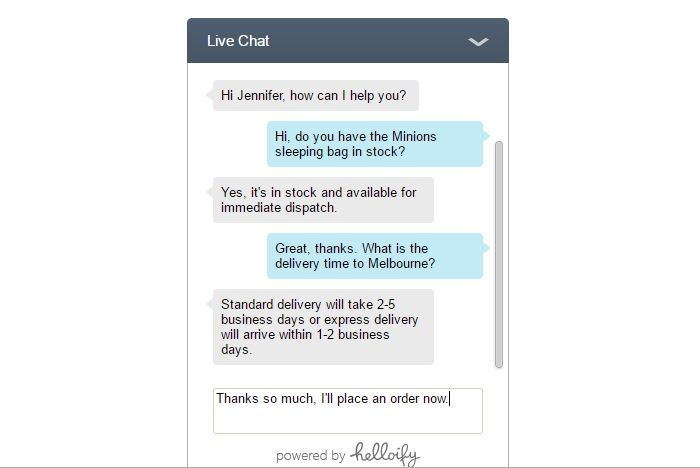 Live help is an important and cost-effective communication channel for businesses to offer their customers and clients. A Helloify administration window used by a representative. Live chat applications not only facilitate informal conversation through enabling users to send and receive text messages, links and pictures for assistance. These customer service applications also offer a variety of additional features and functions aimed at assisting with customer relationship management and adding value to the online operations of a business. Application features vary from one vendor to another, but features consistent in most live support applications include; custom chat windows, proactive chat, real time visitor monitoring, traffic analysis and extensive administration controls for an online agent. 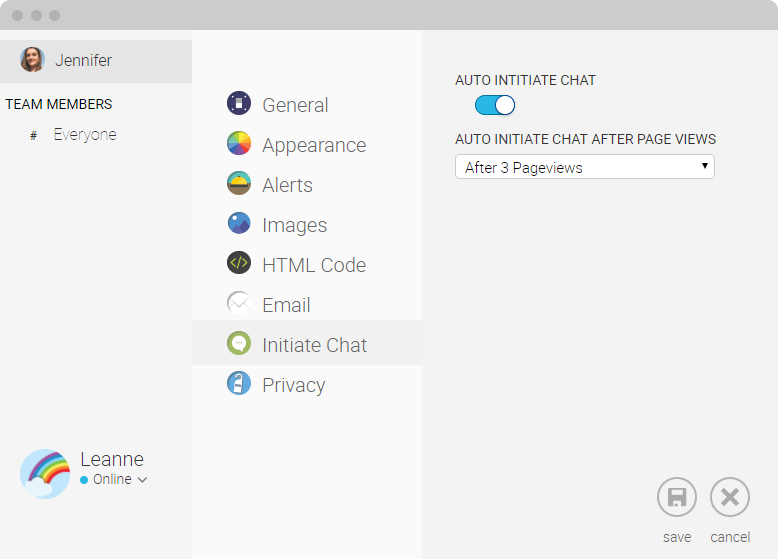 Just some of many administration settings from a online chat application. Software developers supply live support as a self-hosted chat solution or through a Software as a Service (SaaS) delivery model. As a self-hosted solution, the live help software is purchased and downloaded from the vendor and installed manually onto the users own private web server, giving them complete control and is often the preferred option for larger companies. SaaS live support software is licensed on a subscription basis and is centrally hosted and maintained by the vendor as a fully managed service, and requires little or no technical knowledge as the vendor takes care of maintenance.